Black Orchid - mixed-flo fans. The Black Orchid Mixed-flo fan is a tough and efficient in-line extractor fan ideal for air intake and air extraction. Mixed flow technology enables large volumes of air to be moved against resistance caused by carbon filters and long duct runs. Mixed-flo is made from a durable plastic casing and features a mixed flow impeller. The Blauberg ball bearing motor gives the fan a service life of over 40,000 hours of continuous operation, whilst the specially designed casing and impeller blades provide higher pressure and a greater air capacity than industry alternatives. Mixed flow can be easily removed and cleaned with two easy access clips. 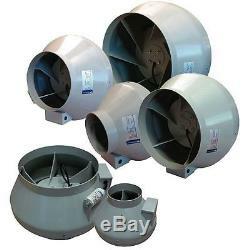 This also also be used to turn your fan around to supply air into your grow room or tent. Supplied with 1.8m power cable and fitted UK plug. Specially designed mixed-flow impeller ensures high air capacity and low noise levels. We stand behind our products. Any product you return must be in the same condition you received it and in the original packaging. We do our best to process as quickly as possible. The item "System Air RVK In-Line Extractor Fans Ducting Ventilation Hydroponics Grow Room" is in sale since Friday, July 5, 2013. This item is in the category "Garden & Patio\Hydroponics & Seed Starting\Environmental Controls". The seller is "bettergrowhydrocardiff" and is located in Cardiff, Cardiff. This item can be shipped to United Kingdom, Antigua and barbuda, Austria, Belgium, Bulgaria, Croatia, Cyprus, Czech republic, Denmark, Estonia, Finland, France, Germany, Greece, Hungary, Ireland, Italy, Latvia, Lithuania, Luxembourg, Malta, Netherlands, Poland, Portugal, Romania, Slovakia, Slovenia, Spain, Sweden, Australia, United States, Canada, Brazil, Japan, New Zealand, China, Israel, Hong Kong, Norway, Indonesia, Malaysia, Mexico, Singapore, South Korea, Switzerland, Taiwan, Thailand, Bangladesh, Belize, Bermuda, Bolivia, Barbados, Brunei darussalam, Cayman islands, Dominica, Ecuador, Egypt, Guernsey, Gibraltar, Guadeloupe, Grenada, French guiana, Iceland, Jersey, Jordan, Cambodia, Saint kitts and nevis, Saint lucia, Liechtenstein, Sri lanka, Macao, Monaco, Maldives, Montserrat, Martinique, Nicaragua, Oman, Pakistan, Peru, Paraguay, Reunion, Turks and caicos islands, Aruba, Saudi arabia, South africa, United arab emirates, Ukraine, Chile.